The Full Sunshine Coast Camping Experience! Only 90 minutes by ferry from West Vancouver and a 30 minute drive from the Langdale Ferry Terminal to Sechelt Inlet, Bayside Campground & RV Park is your home away from home for an overnight stay, weekend getaway, or even a week or longer! We are open year-round, and offer 16 private tenting sites, 10 partial hookup sites, and 20 RV full hookup sites (including drive-through sites for your convenience). There are plenty of activities for the whole family: a children's play area big enough for an impromptu soccer match, a beach style volleyball court, horseshoe pitch, kayak and paddleboard rentals from our watersports partner with launch access across the road, and we're a great destination for anyone enjoying the Coast Gravity Park's amazing downhill mountain bike courses. We even have a bike wash station! Nearby are hiking trails and a short drive is access to the Tetrahedron backcountry and Mount Richardson. In the winter, enjoy Dakota Ridge for snowshoeing, skate and track cross country skiing, and backcountry ATV trails. Whether you're a townie or an outdoor adventurer, there's plenty to do right nearby. 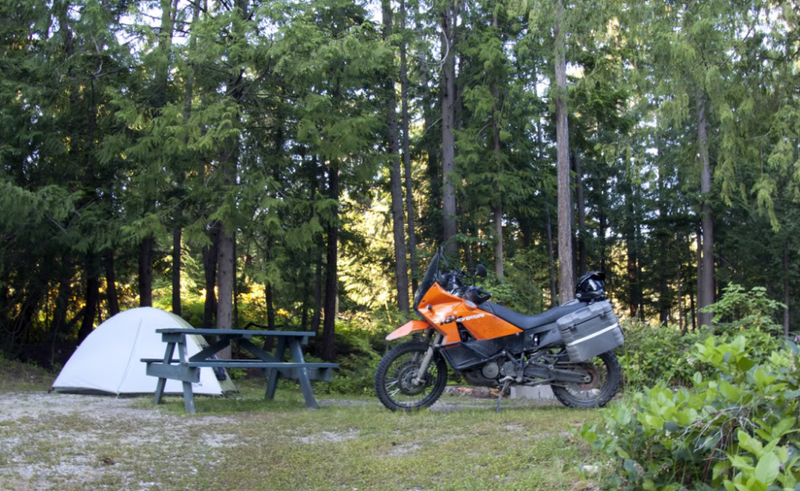 Bayside Campground & RV Park is the closest campground to the Village of Sechelt and it's an easy straight drive in either direction to get where you're going. Sechelt Village is the main downtown core of Sechelt, but the sub-communities of West Sechelt, East Porpoise Bay, The Shores, Wilson Creek, Selma Park, and Davis Bay - pictured above - are all considered to be within the municipality. Enjoy beach time under big skies in Davis Bay on low tide, take a sightseeing flight, shop the many independently owned businesses in the central part of town, visit local galleries, and dine out at one of the many eateries nearby. Drive 20 minutes to the east and you're in funky Roberts Creek, where you can visit the Gumboot Nation, with an all-year painted mandala at the waterfront. 20 minutes to the west puts you in charming Halfmoon Bay/Secret Cove with hidden gems of beaches, lake and parks. There are SO many things to do around Sechelt Inlet and around the Coast for outdoor activities. Sechelt Inlet is referred to as 'the Inland Sea' and offers miles of easily accessed marine trails, and you can choose from kayaking, paddleboarding, boat tours, sailing, canoeing and diving in nearby Tzoonie Narrows or at the HMSC Chaudiere, a sunken Navy vessel up-Inlet. If the land is more your style, Coast Gravity Park is getting a fierce reputation for excellent downhill mountain biking on trails built by experts who grew up in our forests and mountains. Or hike into the backcountry, or rent a bike and take a leisurely wander; in the fall there is excellent foraging for edible mushrooms for those who know what they're doing. There are also many GREAT places to take your dog, including a few off-leash parks, for well-behaved pets under their owners' control.